I LOVE leadholders! I really do, but - and please give your opinion if you disagree- everytime I do a review about a leadholder, I feel like there's only so much one can say about it. Especially because it all depends on the lead you put in it, which is, frankly, in my case almost always the same. That's why I decided to make this review about the David Hayward Carbon 5.6mm leadholder a more picture-heavy post. I already blabbed about the 'Hexagonal', another offering from David Hayward, which is fairly similar when it comes to dimensions, and the internal mechanism, so if you want to read more about it, I'd suggest checking out that review. The 5.6mm version compared to the mechanical 2.0mm version that I'll also review soon! When it comes to looks, this carbon fiber version is by far the best looking leadholder I've ever seen. It easily beats the Hexagonal, but that's a mere matter of personal taste. The matte carbon fiber and brushed nickel plated parts give this leadholder a very raw, almost industrial appearance. The cool design, combined with the sheer weight of the brass body (on top of which the actual carbon fiber body is glued) and bulky dimensions, give this pen a high-end, solid look and feel. It's as thick, but slightly longer than the Kaweco sport leadholder. What I really like about it, is the fact that the carbon fiber barrel isn't coated, which is often the case with carbon fiber pens. Instead, it has a nice matte finish that is very soft to the touch. The carbon fiber has a lot of depth, and looks very natural compared to that of some pens out there. The price of this carbon fiber leadholder is actually the same as the Hexagonal offering from david Hayward. It's still a hefty 66 GBP / 85 EUR, but for me, this one seems to be more worth the money than the Hexagonal. 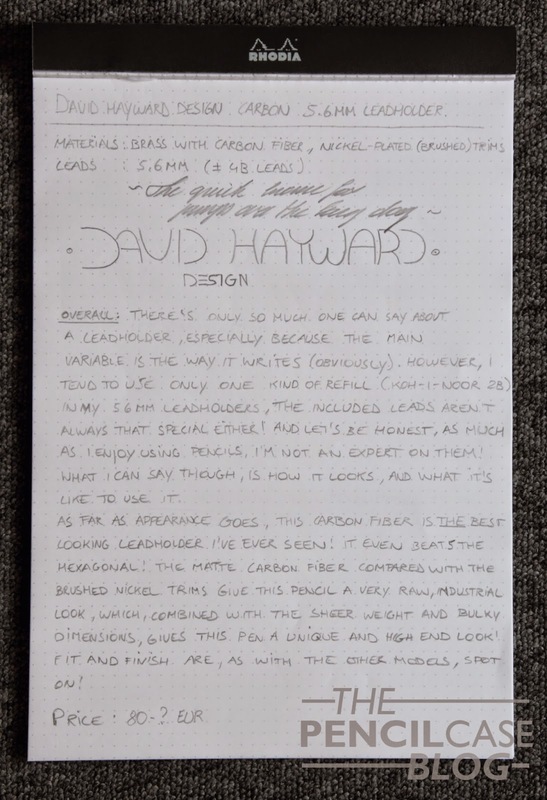 Note: this pencil was sent to me by David Hayward Design, free of charge, so I could write this review. I was in no way influenced in the making of this review, nor was I monetarily compensated. The opinions shared in this review are completely my own! Nice looking lead holder. The carbon fiber gives it a no nonsense look. Kewl! Beautiful! I'm unable to find it in Mr. Hayward's site, is it already available?